This post will be short. Mike said something today in our time of worship that I’ve been thinking about and letting simmer. Conviction is NOT to be confused with condemnation. 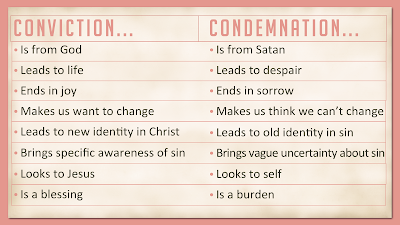 If you are in Christ, then there is now no condemnation. In fact, as you read this sentence, there is now no condemnation. We cannot confuse the discomfort of conviction with what it is NOT. 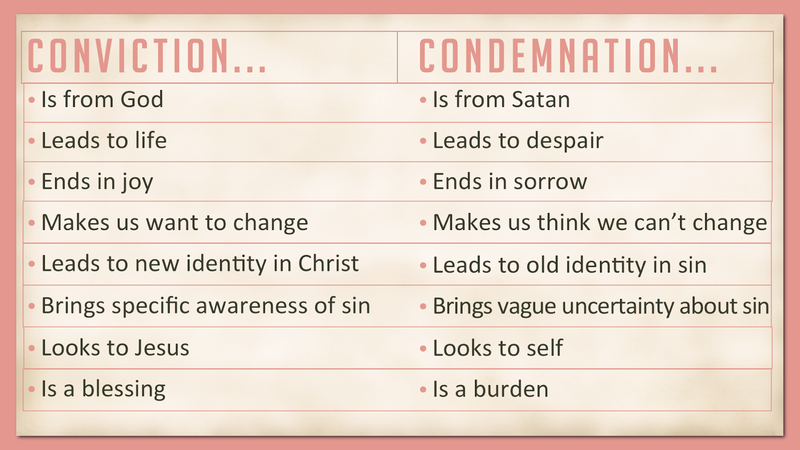 Conviction is not condemnation. Perhaps people don’t know the difference because of how they have been handled in the past by other Christians or family members. It’s easy to see why not, with a culture of critique around every corner in real life, and even more so with the bravery and brashness that people feel entitled to divvy out from behind a computer screen with just the click of a button. So, when actual conviction pricks the spirit, how does a person react? How should he or she respond? How should we respond? People often come to us when they are broken or in need of something. Then over time, after those needs have been met, they may distance or isolate themselves, holding certain areas (that we don’t even know about) “off limits.” People will sometimes pull away as if our love for them has changed, and nothing could be farther from the truth. I remember being in the 10th grade and my mom told a hurting young woman, “Ami is great to talk to; she won’t judge you.” The woman opened up to us, and her road to healing began. That memory stands out in such a powerful way, and while I haven’t always held up to my mother’s compliment, I certainly do try. The only way to help a person who is confusing conviction with condemnation is to be consistent with acceptance, regardless of his and her life choices. That’s hard for most churches, and it’s extremely hard for legalistic Christians. It’s even hard for the person to receive. It’s hard to watch a person pull away, but prayer allows us to continue to keep a soft heart toward them, and I can’t think of any person in my life for whom the “welcome back” door is not left open. Everyone struggles with something. It is not my place to judge, only to love. As we have seen men and women open the door to God’s Handiwork when their convictions have been pressed, the results have been remarkable! Miraculous. Wholeness arising in areas that they always thought would be broken. Having a critical spirit does not do anyone any good. Ever. Criticism from either side breeds suspicion. Suspicion builds walls that are nearly impossible to tear down. Usually men and women with “trust issues” have not been able to love unconditionally; perhaps they have never been loved that way. As we are convicted of things this week, let’s open the door for God’s fullness in each specific area. “Lean on, trust in, and be confident in the Lord with all your heart and mind and do not rely on your own insight or understanding. In Christ is the complete fullness of the Deity. Jesus knows exactly how to handle your every question, and mine, and believe it or not, there are people who love him enough to love you without criticizing while you try to figure it all out (or rather, stop trying to figure it all out and surrender to his guidance and care, making straight paths under your feet). Oh, that my children will learn to love people in such a way! And how will they learn? Excuse me now while I take some things to God and continue on with some much-needed conversations…. We need to handle others and ourselves carefully while experiencing conviction. As conviction leads to open conversations, the surrender of true conviction brings about the new, the glorious.